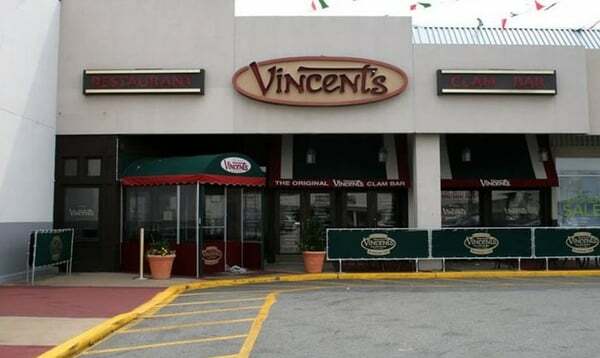 After seeing Vincent's Clam Bar was rated the Best of LI for Best Italian Restaurant, Best Restaurant, and Best Calamari, we just had to try it. The restaurant carries a lot of history as it began in NYC as a street cart in 1894, and became an official restaurant in 1904. As you walk in you can see plenty of photos on the walls of famous customers over the years. Just past the entrance is a showcase of sauces for purchase, since Vincent's is pretty much all about the sauce! We noticed as soon as we walked in that it was pretty tight. It was also rather loud, so maybe it isn't the best place for you if you want to dine quietly. There are a few different dining areas, all were pretty busy for lunch, especially considering it was snowing pretty heavily! After a short wait, we were seated and set up with two magnetic drawing boards for the kids. Great way to keep them occupied! Bread was brought to the table and our waitress poured some olive oil onto a small plate for dipping. She said it was rosemary infused olive oil but it didn't taste any different than plain olive oil. She gave us very little, so we ended up grabbing the bottle off the next table to get some more. We've read in other reviews that that the "infused" olive oil is usually poured over herbs and spices on the plate, but there was no herbs for us. Maybe they changed the way they do it. Considering Vincent's was rated Best Calamari, we thought we should try it. 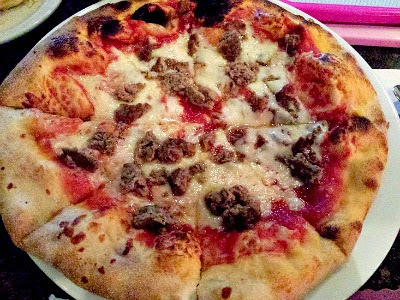 We ordered that, along with Chicken Marsala with a side salad, Shrimp Scampi Oreganato with linguine and a Kids Meatball Pizza. The Calamari came out pretty quickly, and we dug right in. It was crispy and well cooked, but really wasn't anything special to be considered the best. It was actually on the bland side and really needed the sauce, which was very tasty. Worthy of Best of LI? We don't think so. In our opinion, La Volpe would've been a better choice. The salad came out at this time, and it was delicious! The vinaigrette was just like Olive Garden's, which I know a lot of people love. When the entrees arrived, we were shocked at the size of the pizza! It's really enough for 2 to 3 kids. The Shrimp Scampi consisted of 7 medium sized shrimp. There was a lot of pasta, but really not enough sauce for it. The pasta was on the dry side too, and just not that enjoyable. We actually took it home to fix it the next day with some butter, garlic and wine, and once we did, it was great! Just a note, a favorite for Shrimp Scampi is Mulberry Street in Babylon (with pasta instead of risotto), but even that from Miller's Ale House is better. What we had here was some of the worst--I'll give them the benefit of the doubt and say maybe it was an off day. The Chicken Marsala was good, but at first I was worried about how the sauce looked. 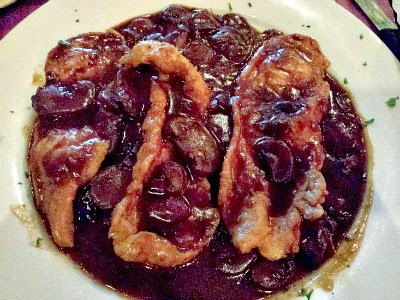 We've never seen such a dark or thick Marsala sauce, but it tasted delicious. The thinly pounded chicken was a bit overcooked though and needed the sauce to cover up how dry it was, and since there was plenty of sauce, the dish was fine. Probably the best tasting and well cooked thing we had was the pizza! It had the perfect amount of sauce, cheese and meatballs, didn't fall apart and tasted delicious! We didn't finish our entrees and had them packed so that we could try some dessert. We tried the Brownie Sundae and the Tiramisu. The desserts are huge! 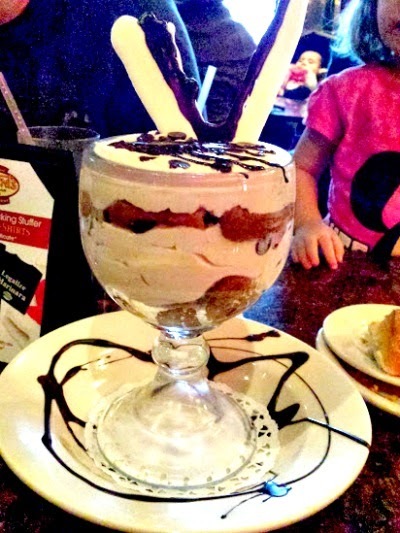 The brownie sundae is everything you'd want and expect--a warm fudge brownie with vanilla ice cream and whipped cream. The Tiramisu was very large and served in a large round sundae glass. It was just okay, and actually a bit of a pain to eat. There is a chocolate V to represent Vincent's on top, and then loads of chocolate chips on top, and at different layers as well. Since it is very cold, the chocolate chips are hard and difficult to get through, and not typical of a tiramisu. The lady fingers were soggy and there was no amaretto taste, just espresso and chocolate. I love a good tiramisu, and this was just not it for me. Service was fine throughout our lunch; there were a few times we waited awhile for refills but nothing terrible. It was a great place to bring the kids, and there were many families with young children there. Since the tables are so close together, I was hit in the back of the head twice by passing waitstaff though, never an apology. The prices for lunch were good, especially considering the portions, but I can't say that we would ever go back. It was really just okay, and with so many other options for great Italian food in the area, we would rather go someplace else. Our opinion for Best of Long Island? Best Calamari: La Volpe. Best Italian Restaurant: La Volpe. Best Restaurant: Prime.